Homelessness on campus. Photo via CBS News. College senior Jasmine Bigham can almost taste graduation. Like most students at Humboldt State University, nestled in the shade of the California Redwoods, finals are coming, and she’s studying hard. But it’s her life outside her college classroom that may be the toughest test of all. “The hardest thing was just not being able to find housing, and so that was, like, the big issue that stood in my way,” Bigham said. “So, what did you do?” asked correspondent Lee Cowan. 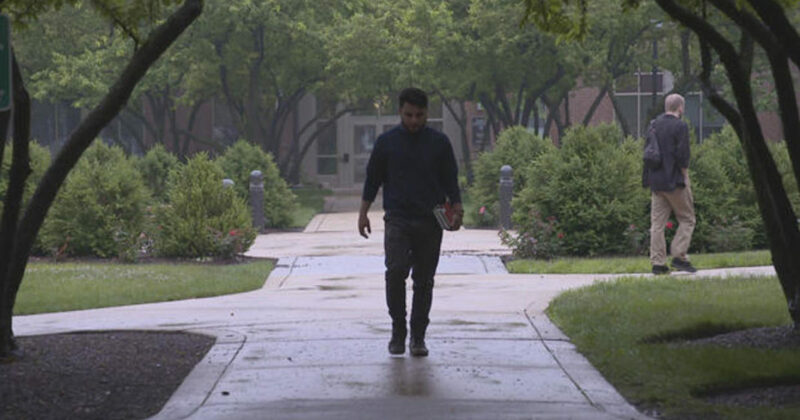 Being homeless isn’t something you’d expect from a student on a Ford Family Foundation scholarship, but even that money wasn’t enough to help with the high cost of housing near campus. “But you put yourself here for a good reason, though, to get through school,” said Cowan. Jasmine Bigham lived in a van while attending Humboldt State University in California. Photo via CBS News. Every morning she makes her way to a women’s locker room on campus. There, she brushes her teeth, showers, and then heads off to class. Later, it’s back to the van. The number of homeless college students struggling just like Bigham is hard to quantify, but it’s big. According to financial aid applications, there are more than 68,000 students who claim to be homeless. “I think the idea that hard-working, talented people who are trying to get an education are being derailed by homelessness, is a crisis,” said Sara Goldrick-Rab, the leading national researcher on the problem. She’s a professor of higher education policy at Temple University in Philadelphia, and the founder of the Hope Center. “One of the things that’s changed in the United States over time is that, if you grew up without money, we have sent a pretty strong signal to those students that financial aid is available, and you should try college, because it’s your route out of poverty,” Goldrick-Rab said. Some of those struggling with housing responded to a recent survey that Goldrick-Rab conducted. It was the largest of its kind ever done, involving more than 43,000 students at 66 institutions. The result: Nearly one in ten college students said they were homeless in the last year, meaning they had at least one night where they didn’t know where they were going to sleep. Colleges generally don’t like to talk about homelessness, she said, and neither do most students. “There’s that underlying feeling of just shame, that feeling of loneliness,” he said. Coronel’s parents have been out of the picture since childhood – his mom has struggled with addiction, and his dad has been in and out of prison. 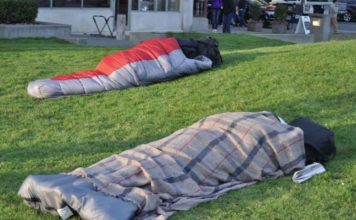 Dom Coronel, a student at DePaul University in Chicago, would sometimes sleep on the streets if he couldn’t get into a shelter. Photo via CBS News. “Even now, still?” asked Cowan. An office at Dax House was converted into a bedroom for college student Dom Coronel. Photo via CBS News. Homelessness is indiscriminate. It can effect anyone, anywhere. Sara Goldrick-Rab has found students struggling all across the country, from big universities to rural colleges. Luck isn’t something most educators can spot, even if they see these struggling students every day. Santa Monica College doesn’t offer housing, but the school has tried to address students who are going hungry by offering food pantries. “We have a variety of canned beans and ravioli, and of course peanut butter – all the college staples!” Jeffery said. While helpful, they’re not the healthiest options, so students worked with administrators to organize a farmers market, where fresh fruits and vegetables are handed out each week, no questions asked. But perhaps the most innovative idea came from UCLA students who, with the help of donations and grants, set up the Students 4 Students Shelter in a Santa Monica church. It’s completely run by more than 80 student volunteers like Jordan Vega. Preparing meals at the Students 4 Students Shelter in Santa Monica. Photo via CBS News. Maritza Lopez knows she was lucky to get in. There’s a waiting list of at least 100 students. She’s studying Art History at nearby Santa Monica College, and shares a small room with nine other homeless students. As small as it is, it’s coed. Between the hours of 7 p.m. and 7 a.m., a shelter run by students is available in a Santa Monica church. Photo via CBS News. “So, where does all that optimism come from?” Cowan asked. “You say that like you’re shy about it. That’s fantastic!” Cowan said. Lopez is now out of that shelter, and she’s working on her Bachelor’s at her dream school, UCLA, which is covering her tuition.